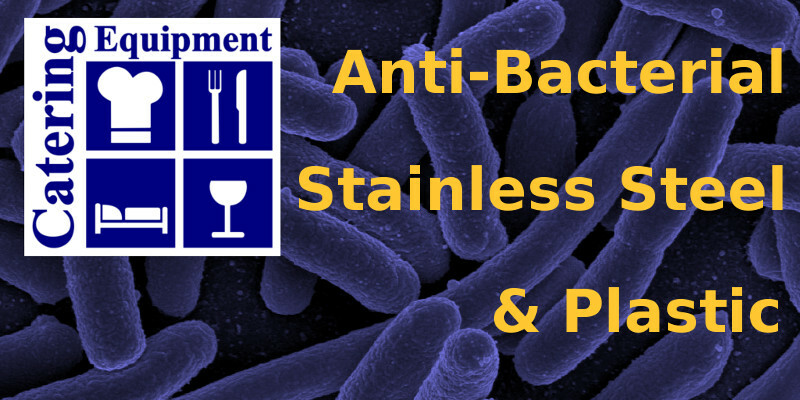 Catering Equipment Ltd can offer in addition to our standard products two special hygienic treatments which give very high levels of hygiene, lasting freshness and very low levels of bacteria retention. Ideal for anywhere where the highest of hygiene are required. ABACO® is the latest-generation thin film antibacterial coatings using the physical vapor disposition application process for strong, durable and attractive finishes. Proven nanotechnology provides leading antibacterial coating properties. The efficiency of ABACO® antibacterial coatings are certified by precision laboratory tests. The nanotechnology used in the complex multilayer architecture of the coating destroys the bacterial cell membrane by interrupting the bacterial cell-division cycle and blocking the bacteria’s nutrition. The ABACO® antibacterial coating properties continue throughout the life of the product and will improve over time ensuring continued antibacterial protection. BioCote is an antimicrobial technology which can be incorporated into plastic based products as an additive during manufacture or after manufacture as an antimicrobial coating. When incorporated in a product, the BioCote antimicrobial properties continue to provide anti-microbial protection for the expected lifetime of the product. ‘Antimicrobial’ defines an ability to, in addition to resisting the grown of bacteria, resist the growth of microbial organisms including bacteria, fungi, moulds and others. Call us now today 0121 773 2286 for more information about our antibacterial product ranges! This entry was posted in News and tagged ant-bacterial, coatings. Bookmark the permalink.